The goal of business is to make sales. It only makes sense that you will also need to track the sales that you make. Where do the sales come from? From whom? These are all questions that can easily be answered using a Sales Lead Tracker template. So many people have a hard time keeping their sales leads together and organized. This is a great way to make sure that the information actually gets organized that you and/or your company needs to know. 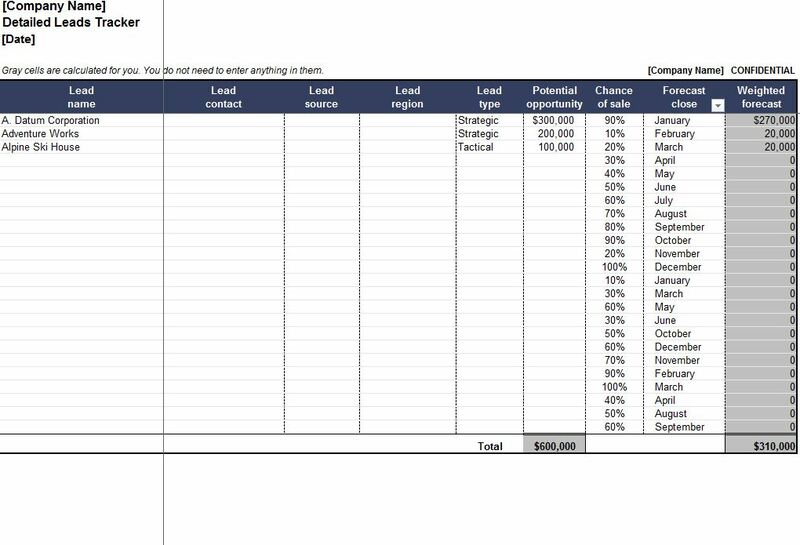 The Sales Lead Tracker template is available for your usage free. The Sales Lead Tracker template is extremely easy to use as an added bonus. Type in all the names that you know who have sales leads and their company’s name. Include where the lead is located and the type of lead that was presented. The next step is for you to type in amount of money that the sales lead may present to you and/or the company. Follow this with typing in how likely the chances are that the lead will sell. This information may make a difference to you and/or the business. The final step is for you to type in when the forecast for the lead closes and the weighted forecast predictions. All these elements are critical aspects that need to be taken into account when you fill out the template for yourself or for someone else. Make sure that you have all of the information that you are going to need in order to successfully customize and make the best use out of this template. You will be extremely glad that you did. A lot of time will be saved! Use all the sales leads that appear to be able to help you and/or your company out financially. Otherwise, downloading this template will not do you or your company any good. It simply puts the information into your hands so that you can do something about it if you want to. All of the sales leads in the world will never do you and/or your company any good unless you follow up on them. Use the potential opportunities to your best advantage! Why would you decide to something to deliberately sabotage yourself and/or your business?